U.S. Labor Market Tightens as Employers Report Sustained Demand for Skilled Workers | ManpowerGroup Inc.
MILWAUKEE, March 13, 2018 /PRNewswire/ -- U.S. employer hiring confidence is staying strong in Q2 2018 as one in five plan to grow their workforce in the three months ahead. The seasonally adjusted Net Employment Outlook for Q2 2018 is +18%, according to the latest ManpowerGroup (NYSE: MAN) Employment Outlook Survey of more than 11,500 U.S. employers. Organizations are planning to add staff across all 13 industry sectors in Q2 2018. Employers report the strongest hiring intentions in Leisure & Hospitality (+28%) as the economy picks up. Strong Outlooks for Professional & Business Services (+24%) and Wholesale & Retail Trade (+23%) point to demand-driven growth in line with increased wages. Employers in Wholesale & Retail Trade report some of the most optimistic Outlooks in more than 16 years as online retail continues to grow and the increase in distribution workers is expected to rise. The weakest Outlooks are reported in Mining (+15%), Government Information (+14%) and Nondurable Goods Manufacturing (+12%). "We're seeing solid, demand-fueled growth across the U.S. as the economy continues to strengthen and the labor market tightens at pace," said Becky Frankiewicz, president of ManpowerGroup North America. "The competition for skilled talent is set to heat up and a just-in-time approach isn't always getting employers the skills they need when they need them. Now is the time to invest in people by upskilling America's workers. We should also seek untapped talent sources with adjacent skillsets that can adapt to fill in-demand positions. 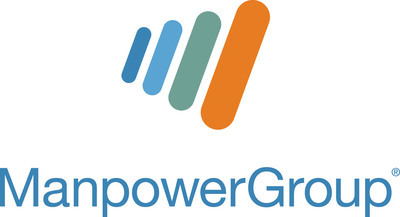 At ManpowerGroup we accelerate people's careers offering skills development to help people access in-demand opportunities. Our MyPath™ offering has provided 120,000 U.S. associates with advice and opportunities to increase their skills and earnings. Upskilling the workforce and building employability will be the solution to the Skills Revolution." View complete Q2 2018 survey results for the U.S: www.manpowergroup.us/meos. Nationwide, employers in all 13 industry sectors expect to add staff in Q2 2018. The strongest Outlooks are reported in Leisure & Hospitality (+28%), Professional & Business Services (+23%), Wholesale & Retail Trade (+23%), and Durable Goods Manufacturing (+19%). Transportation & Utilities (+19%), Construction (+17%), Education & Health Services (+16%), Financial Activities (+15%), Mining (+15%), Government (+14%), Information (+14%), Nondurable Goods Manufacturing (+12%), Other Services (+11%). Employers in all four regions in the U.S. report a positive hiring Outlook for Q2 2018. By region, the Outlooks are: Midwest (+20%), Northeast (+17%), South (+18%), West (+19%). Hiring prospects year-over-year are slightly stronger in the Midwest (+4% year-over-year) and the Northeast (+2% year-over-year). Employers in the South and the West report relatively stable hiring intentions when compared with the second quarter of 2017. For the coming quarter, employers in Wisconsin (+30%), New Hampshire (+30%), Alaska (+29%), Maine (+29%) and Colorado (+27%) report the strongest Employment Outlooks. Of the 100 largest metropolitan statistical areas, the strongest job prospects are expected in Provo, Utah (+32%); San Antonio, Texas (+32%); Madison, Wis. (+30%); Columbia, S.C. (29%); Seattle, Wash. (+29%); and Syracuse, N.Y. (+29%). Complete results for the ManpowerGroup Employment Outlook Survey are available for download at www.manpowergroup.us/meos. The Q3 2018 survey will be released June 12, 2018. To receive email notifications when the survey is available each quarter, visit http://meos-press.manpowergroup.us.